The BUNGEE TRAINER is a bungee cord with a rope ring and sliding pulleys that allow 360 degree movement around your body. 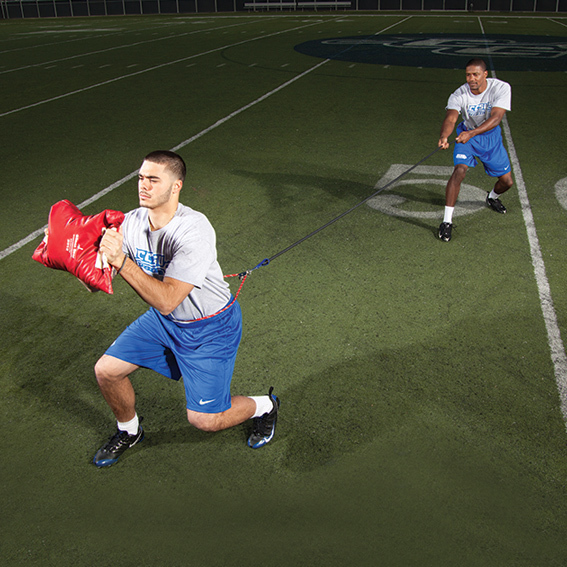 With this tool, an Offensive Lineman can pass set while experiencing game like resistive force. When one end is stationary and you move toward it, it offers assistive training. Use it for change off direction drills and to test speed and quickness out of a stance. Excellent for step and punch drills and take-off's. Elastic resistance puts stress on the lower body and forces an O-Lineman to play with his cleats on the ground and to anchor his core. It's a great workout for your lower body. Simulates the same dynamic force and resistive stress experienced in blocking a defender without the physical contact. Available in two sizes: 9' long and 24' long. "The coaching point is to strengthen your lower body and core to develop stability and balance out of your stance!"